Atheneum Books for Young Readers, 9781442460881, 240pp. Experience the wonder of the river in this “quietly powerful story” (Kirkus Reviews) where family is lost, friends are found, and hope runs in the current. One morning, River Rose Byrne wakes up talking like nobody else, and she doesn’t know why. Maybe it’s because her beloved older brother, Theron, has abruptly vanished. Maybe it’s because that bully Daniel Bunch won’t leave her alone. Or maybe it has everything to do with the eerily familiar house that her mind explores when she’s asleep, and the mysterious woman who lives there. River has to puzzle through these mysteries on her own until she makes a strange new friend named Meadow Lark. But when she brings Meadow Lark home and her mother reacts in a way that takes River by surprise, River is more lost than before. Now all that’s left for her to do is make wish after wish—and keep her eyes open for a miracle. Marilyn Hilton’s haunting debut dives down deep into murky waters brimming with secrets, sorrow, and hope, giving us faith in the things that we seek, but haven’t yet found. Marilyn Hilton grew up in Massachusetts in a nest of family filled with a delightful abundance of cousins. From her father she learned to explore New England’s back roads, and from her mother she learned to look beyond what can be seen. She has published numerous short stories, poems, and essays as well as a nonfiction book for tween girls. 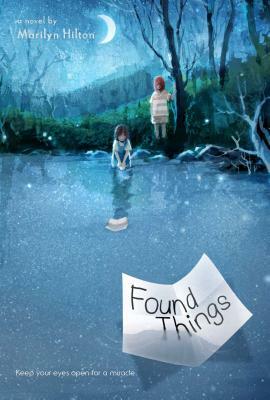 Found Things is her first novel. Marilyn now makes her home in Northern California with her husband and three children, where she writes, tap dances, and finds miracles on life’s back roads. "With its effective river motif, this realistic, quietly powerful story unfolds slowly in the words of its thoughtful heroine, who eventually finds the things she had lost. A moving debut about secrets, wishes, friendship and trust." "In her atmospheric first novel, Hilton. . . transports readers to the deep woods of Quincely, N.H., and into the mind of 11-year-old River Rose Byrne. . . . An eerie sense of foreboding. . . creates tension that will carry readers through the book like the current of the river that River is so drawn to." "Debut author Hilton weaves a gentle story of steadfast hope in the face of loss, told from the perspective of an intelligent, sensitive young girl who is perceptive beyond her years. River’s sometimes poetic first-person narration reveals her gradual understanding of the ways Theron’s disappearance reverberates throughout her community. With enigmatic Meadow Lark benignly prodding her forward, River bravely seeks out answers and learns valuable lessons about forgiveness and faith." "Marilyn Hilton's debut novel FOUND THINGS…covers an impressive array of topics including depression, bullying, hope and the nature of friendship…. I was particularly impressed with the treatment of River's feelings about being adopted, which are complex, heartfelt and very real…at its core, FOUND THINGS is the story of a young girl understanding how to sing her song in her own tune."